Looking from outside, the left hand casement is opening and the right is fixed. Glazed with 24mm units. 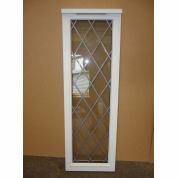 6.4mm Laminated outer and a 4mm toughened inner pane. There are some areas of damage, as seen in photos.